The last lions in North Africa ended up in isolated micro populations in Morocco and Algeria (Black et al 2013). Some of these tiny groups quite likely survived for a decade or more in southern Morocco (certainly from the mid 1930s onwards) and North Eastern Algeria (from the 1940s onwards). Today the picture in West Africa is startlingly similar. 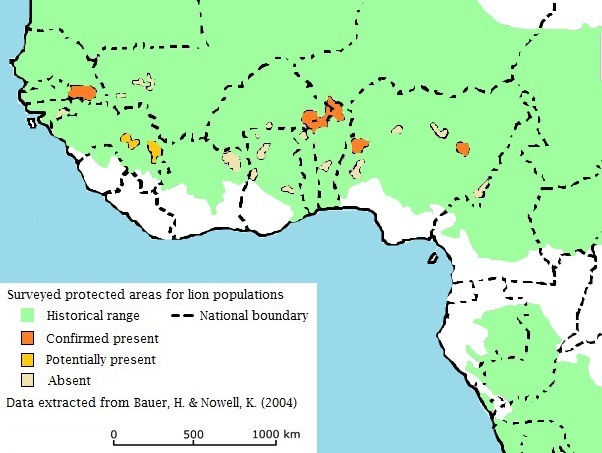 In a recent survey, of 21 sites previously considered as known habitat for lions, only four sites still had confirmed presence of lions (indicated in dark orange in the map above). Our research into North African populations suggests that these tiny groups may survive another few years, maybe a decade, perhaps unnoticed even by local people, but will then rapidly decline into oblivion. 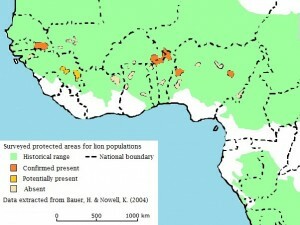 The sites shown yellow are likely to have micro-populations of lions exisitng at this point already. Unlike wildife experts at the time of the Barbary lion’s final demise, we are now much better informed about what this decline would mean and can make choices about how to prevent it. This entry was posted in Conservation on October 23, 2014 by Simon Black. Lions inhabited north Africa from the Mediterranean coasts of Morocco, Algeria and Tunisia up to the mountain slopes of the Atlas ranges which fringe the northern of the Saharah. The shaded areas of the map (right) show the most suitable habitats across the region. Lions observed traversing semi-arid areas kept close to water points. 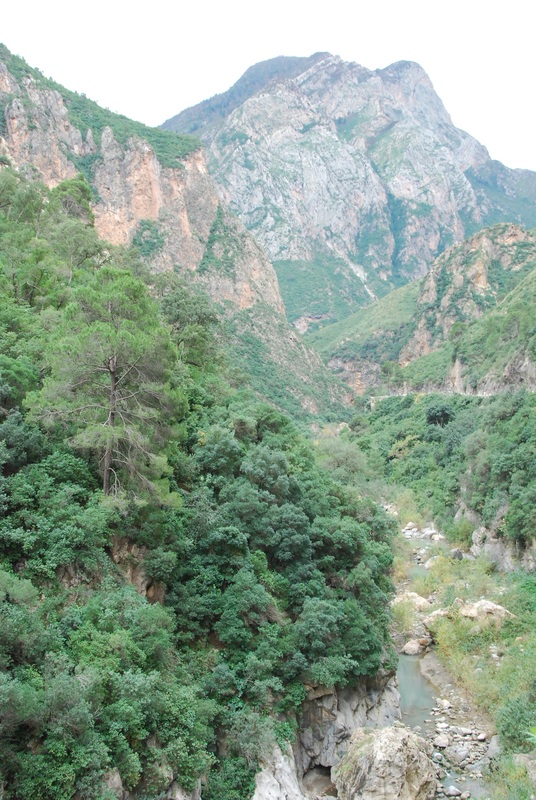 The High Atlas range runs west-east from Morocco’s atlantic coast (north of Agadir) into the Morocco/Agleria Border. Lions could be tracked in the snow of the High Atlas mountains. The Middle Atlas in Morocco (around cities such as Fez) run northeastwards towards the coast. Sightings were common in the forests of these regions. 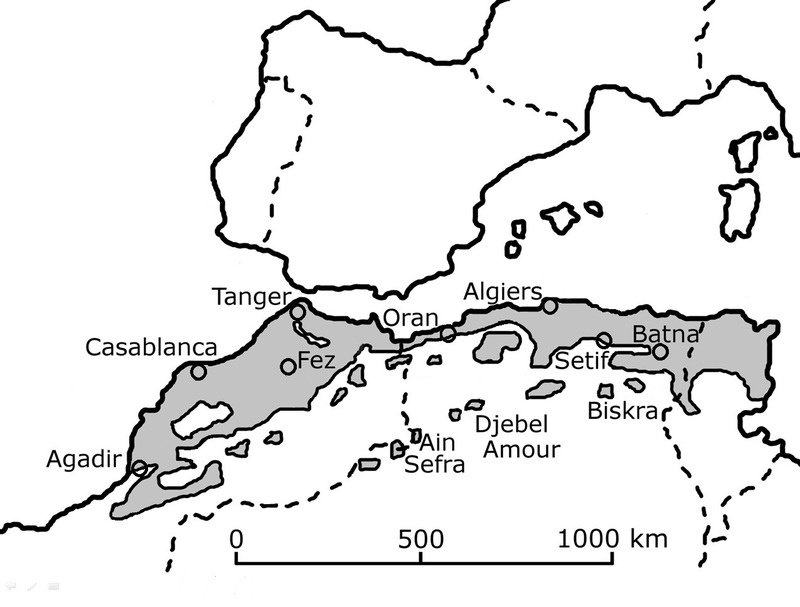 North of the middel Atlas are the coastal Rif mountains which spread up towards Tanger (Tangiers) overlooking the Mediterranean towards Gibraltar and Spain (the Rif are geologically similar to Spain’s Sierra Nevada, rather than being part of the Atlas chain). The Anti Atlas in Morocco run from the Saharah in the south up towards Agadir and the High Atlas range.Lions were not commonly seen in this region, although several later sightings in the 1930s suggest small populations had been marginalised to these remote semi-arid areas. The Tell Atlas run for 1500km from Morocco’s Middle Atlas along a line west-east, passing south of the Algerian cities of Oran and Algiers, parallel to the Mediterranean Coast. 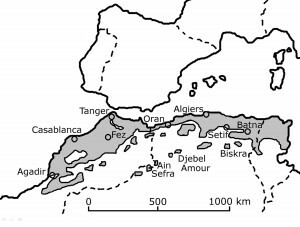 Further shouth, the Saharan Atlas are the boundary of the Sahara itself (shown by the areas around Ain Sefra and Djebel Amour in the map). The Aures mountains are the easternmost part of the Atlas range, crossing the northern Algeria-Tunisia border. The western Aures intersect the Saharan and Tell Atlas at the Belezma range (which hold important cedar forests). The forested mountain areas around Setif (see photograph, left) contrast strongly with the drier regions south towards the oases such as Biskra. This entry was posted in Ecology on October 7, 2014 by Simon Black.